Though several states recently passed legislation allowing for the legal sale of cannabis, the country still has a long way to go in normalizing marijuana culture and destigmatizing cannabis users. Luckily, there are hotspots located around the U.S. that welcome stoners from all over, encouraging the safe use and distribution of products. Either way, since Portland has officially legalized adult marijuana use laws, there is little stopping the city from driving cannabis into the American mainstream. One of the best examples of Portland’s saturation with cannabis culture is Sandy Boulevard’s Green Mile. The term refers to the high concentration of marijuana dispensaries located in close proximity along the road. The Green Mile starts with the always consistent Treehouse Collective (THC PDX) and features everything from established neighborhood businesses like Collective Awakenings to the growing conglomerate, Nectar. Each dispensary on the Green Mile offers something different for each customer, including a wide array of cannabis flower, concentrates, edibles, tinctures, paraphernalia and so much more! Most dispensaries throughout the City of Roses update their store menu on Leafly, so customers only have to visit one forum for locating their favorite strain in the city. What more could the active stoner ask for than America’s largest city park as their playground? Forest Park, located in NW Portland, boasts natural landscapes with rugged trails of varying difficulties that offer an escape from the hustle of downtown. While I’m not advocating consuming cannabis on public property, it might behoove you to pick up an edible before making a trek. If you’re looking to get even further from the city, consider taking a trip out to the Columbia River Gorge, Sauvie Island or Mount Hood. The pacific northwest is unique in its variety of natural landscapes, including temperate rainforests, breathtaking coasts and gorgeous farmland. The Oregonian made history as the second major newspaper (following the Denver Post) to contract marijuana critic jobs. This was a major step in destigmatizing marijuana and adding journalistic credibility to cannabis culture. Additional publications like the Willamette Week and The Portland Mercury dedicate special columns to cannabis news and journalism. What makes Portland the perfect community to take on such a dank cannabis culture is the open community dialogue Portlanders so often engage in. Though from the outside the city appears to have embraced cannabis without conflict, the city is constantly engaging in conversation over federal, state and municipal weed policies and how they correspond with Portland’s demographic. For instance, even with legalization, reports of police intervention with people of color in regard to cannabis is still a major issue. The white and wealthy have very little to worry about carrying an eighth or less on them in transit; however, racial stigma still puts minorities at greater risk of being bullied by the law. For this reason, advocacy groups are still necessary in dismantling the association between race, cannabis and criminal activity. Despite the upscale nature of many Portland dispensaries, Bridgetown actually has some of the lowest prices for flower in the country. Cheatsheet.com recently ranked Portland 3rd in an article on cities with inexpensive cannabis. While prices differ from store to store, it’s not unlikely to find a good, inexpensive eighth for $40. It might not be top shelf, but it’s definitely better than what you smoked in college. 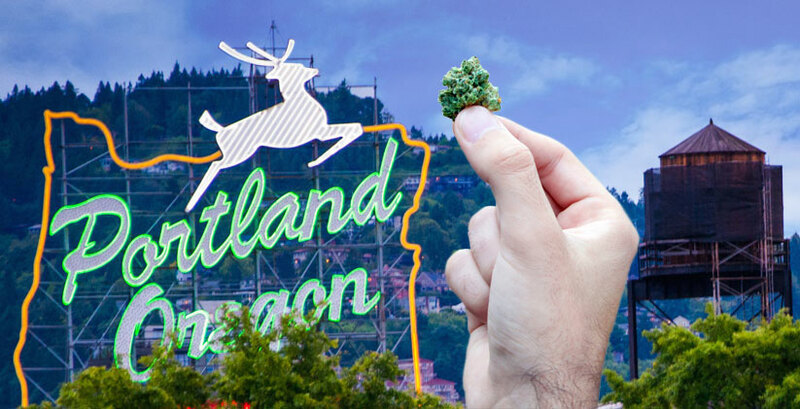 Portland is a cannabis industry powerhouse in its own right, but the city also contributes to a strong network of west coast cities leading the marijuana revolution. When recreational marijuana legalization was finally passed for the state of California in November, 2016, every state on the west coast (including Alaska!) officially became “legal.” Living in cities like Portland, or Seattle, WA are prime spots to enjoy cannabis culture and find Portland marijuana dispensary jobs or as bud trimmers for grow operations and production facilities. Luckily, since the network between the west coast states is strengthening, a better standard for regulating cannabis is sure to eventually appear, with the consumer and citizen in mind, over large corporations and government gain. Even with all of the developments Portland has made with cannabis reform up to this point, there is still a lot of room for growth. Major federal advances still need to be made regarding drug testing for THC to work government jobs, as well as federal bank recognition of cannabis dispensaries. Without more major banks supporting the cannabusiness, the industry will continue to experience the high rates of internal and external theft based on almost exclusively cash-based sales. One thing’s for sure: as the cannabis industry develops, Portland will be right there in front, ready to fight the good fight. If recent events give any indication for the future, Portlanders are willing to speak out against injustices and fight for the reform they deserve.